Just like the Milan skies, on Saturday morning Costume National was on the verge of breaking into lighter and sharper colours. 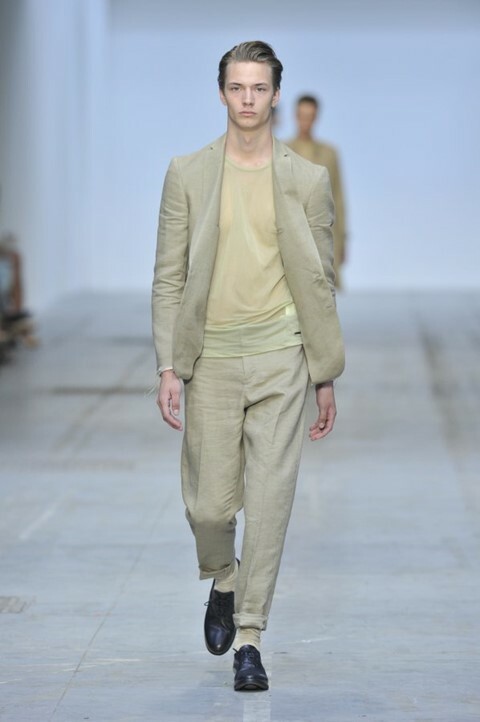 For his Spring Summer 2011 collection, Ennio Capasa went with light grey, white and beige tones, and as such offered hints of a bright summer next year. With Costume National, you know what to expect; uniform styled and minimal outfits, the ones that Capasa (together with Helmut Lang) launched in the 1990s and have perfected ever since. This time around we saw ‘techno tailoring’, which is less about hi tech fabrics (though there were a few fancy pansy organic materials around) and more about skipping lining and seams. Trench coats, double-breasted jackets and see-through tops dominated the catwalk, while LCD Soundsystem sang ‘Clean Yourself Up’ on high volume. There was no need telling Ennio Capasa; his lines and silhouettes were as simple and minimal and clean as a whistle. Dazed Digital: what inspired you for the spring summer collection? DD: It’s quite a sombre colour palette – ever feel like going neon crazy? Ennio Capasa: I don’t feel like that now, I think people want the real thing, and in the society we live in today, they want value, something that they can keep in the long term. DD: A favourite piece in the show? Ennio Capasa: I like the white tuxedo, but also the jackets in organic fabric. My wardrobe will grow big this season!